If you don’t know already, I love Leo Babauta’s work. His thoughts strike a chord in me because he likes simplicity in life – just like the way I do. I even listed one of his books as my children’s must-read book. Leo’s Zen Habits blog was picked as the best blog for Time’s Best Blogs of 2010. And he has authored many books – mainly on self-development, productivity and minimalist lifestyle. About 10 days ago, Leo has just launched his latest book . 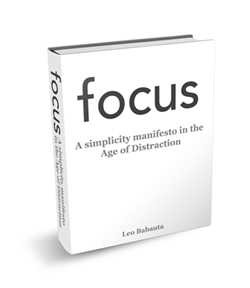 The book is called Focus – A simplicity manifesto in the Age of Distraction. Interestingly, the book comes in two versions: free and premium. If you want you can grab a copy of the free ebook. Even the free version is already packed with useful tips that you can use instantly. As for paid version, besides the free ebook, it also includes how-to videos, audio interview with experts, and bonus chapters. In conjunction with the new book, I took the opportunity to interview Leo – from the perspective of family togetherness. I really appreciate that Leo was quick to answer the questions I sent him. 1. You have just launched your new book called Focus last week. And this is not your first book and definitely not your last. How do you find time to write despite the fact that you work from home and have six children? Leo: I love writing. I can’t wait to do it. I get up in the morning before the wife and kids, just so I can have quiet time to write. I hope to never stop loving it. 2. What is the biggest mistake parents make as far as finding time to focus on family is concerned? Leo: Often it seems that we put time with our family on a lower priority level than other things, like work. So when push comes to shove, and something comes up at work, our time with the family gets pushed back or canceled. That’s the wrong approach — time with family is just as important as anything else, if not more so. So when something comes up at work, we need to say, Sorry, I can’t. I learned to do this when I had a job, even if it meant risking my job. That’s not easy, but if you don’t do this, the job will overrun your life. 3. What is your tip for parents who are extremely busy and always on the run? How do they focus on family? Leo: Simplify. Cut back on your commitments, if time with your family is important, so that you have the time. If you don’t have the time now, it’s because you’re overcommitted. Cancel some commitments, say no to people, and make the time. It’s really a matter of living what you say your priorities are. 4. Do you spend one-to-one time with each of your six children? What kind of activities do you do with them? Leo: I try to, though it’s not always easy to spread it out evenly. I read with them, work on projects with them, take walks with them, ask them to help me with things, or just snuggle and talk. 5. What is your advice for parents who have addictions in TV, Internet, etc? Leo: Imagine all the time you would have if you didn’t spend long hours on the Internet or watching TV. Many people spend 5-8 hours a day doing these things. Imagine having that much free time to spend with your family, to get outside to exercise, to read, to write, to create, to have fun! Commit to cutting those activities off after a certain time. When you feel the urge to go back to them, pause, breathe, allow the urge to pass, and go do something absolutely incredible that’s not on a screen. 6. To prepare for their future, there are many things we want our children to learn (look at the number of classes they can attend). What should parents focus on to find simplicity in this regard? Leo: We overcommit our children and give them incredibly busy lives, but we’re sacrificing their free time, their play time. Studies show that this play time is extremely important in developing an imagination, an ability to solve problems, an ability to find happiness. Simplify by only getting them into one activity at a time, and allowing them to have time to play and do nothing. We also need to let go of the idea that we can “prepare” our children for the world by shaping them into perfect human beings — people who are fit, well-read, can play music, create art, recite the capitals of the world, etc etc. Let them grow into who they want to be, and teach them instead to pursue their passions without pressure.